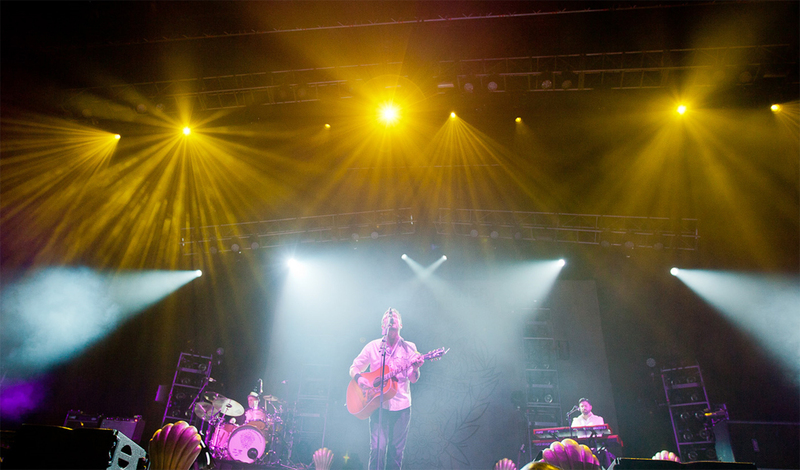 In order to provide English folk/punk singer-songwriter, Frank Turner, with an intricate lighting solution on his most recent tour around the world, Shaun Moore, Lighting Department Director at Nitelites, deployed 14 MAC Viper Washes, 24 MAC Viper Profiles, 48 MAC Aura’s and 20 Atomic 3000’s. Moore’s goal was to create a more visually tactile profile using the MAC Auras in groups of threes and fours, adding depth and width to the rig. The height was added by creating four layers with the use of Vipers, specifically taking advantage of their zoom and iris. Moore used the Aura fixture as a wash and effect light due to its great color mixing and super tight zoom, even when deployed across the length of an arena.